The Antikythera Mechanism is considered to be one of the most bizarre mysteries of our history. It has been studied – at length – since its discovery in 1902; however, in the year 2017, interest in the unique device from the Antikythera wreck was rekindled. This was due to the fact that Google released an intriguing Doodle to mark the 115th anniversary of its discovery on May 17th 2017. It has been estimated that this puzzling device remained in the waters of the sea for approximately 2,000 years. Today, three green-shaded bronze pieces that are misshapen of the Antikythera Mechanism are located in Athens at the National Archaeological Museum, as well as a replica of what it is believed to have looked like as a completed device. Here at Greatest Unsolved Mysteries, we feel that this amazing device from antiquity is highly deserving of special recognition. How Was the Antikythera Mechanism Discovered? In the year of 1900, a wrecked Roman ship that was designed to transport cargo was discovered in Antikythera, Greece. It was not until the year of 1902 that Valerios Stais, a Greek archaeologist, discovered pieces of the Antikythera Mechanism while sifting through the wreckage. He discovered that the pieces were composed of bronze. His original hypothesis was that the pieces were part of a wheel or some type of gear. What researchers would later discover, however, was that the pieces were actually part of a type of analog-based astronomical computer. The Antikythera wreck was considered to be an immense discover in itself; however, no one expected to find an artifact from that wreckage that would spark interest, research, and debate for several generations to come. Why Did Researchers Consider the Antikythera Mechanism Special? As researchers continued to investigate the pieces that made up the Antikythera Mechanism over the years, they were absolutely stunned. Despite the immense corrosion within the pieces, they discovered gears which included carefully crafted triangular teeth. These components were similar to those gear systems found within clocks. Additionally, there were rings within the device that were divided by a degree system. This was much like the protractors utilized in mathematics classes in schools. The sophistication was unlike anything previously discovered and was unmatched for approximately 1,000 years from what is believed to be the date when the Mechanism was created, which is why it is considered to be one of the most bizarre mysteries in terms of ancient mysteries. As time progressed, the studies on the Antikythera Mechanism continued. Divers spent decades retrieving the pieces that we have today. Scholars studied the pieces at great lengths but remained perplexed. In the 1970s and the 1990s, imaging scans were performed on the pieces. Theorists concluded that the device was probably originally created to provide a replication of the motions associated with the sky. One of the researchers was quoted in calling the Antikythera Mechanism an “ancient Greek computer”. Unfortunately, historians at the time of the scans simply ignored the intriguing artifact. It has even been speculated that the device must have been some type of alien creation that got left behind by a UFO. The Antikythera Mechanism continued to be considered one of the most perplexing of ancient mysteries, despite historians losing interest. In the year of 2006, a professional from the Cardiff University – which is located in Wales – named Mike Edmunds pursued research of the Antikythera wreck artifact. He created a team and elected to perform CT scans of the pieces of the Antikythera Mechanism. Naturally, the images that were produced were more detailed than the original scans due to the advancement of the technology. It was, at this time, that the inside of the pieces could be seen more easily and that hidden inscriptions were even discovered. These findings immediately heightened interest among those that specialized in scholarly research. - The Antikythera wreck device is determined to be about the size of an average mantel clock and was likely housed within a case that was composed of wood. - It is believed that the wooden housing included a circular-based face and hands that rotated, much like the standard clocks of today. - The Antikythera Mechanism included some type of knob for the purpose and intent of winding the device. - When the device was being winded by someone, the gear wheels within the device would move seven different hands at different speeds. - This was not a clock that measured time – in hours – as we do today; instead, it measured what the ancients would have referred to as “celestial time”. - There were hands on the Antikythera wreck device that represented the sun, the moon, as well as the planets that are visible to us on Earth - Mars, Mercury, Saturn, Venus, and Jupiter. - The Antikythera Mechanism included both a black ball and a silver ball. These rotated within the device, displaying the various phases of the moon. - The back of the case included two different systems that utilized a specially-designed ancient dial. One of the dials acted as a calendar and the other acted as a time system for the solar and the lunar eclipses. 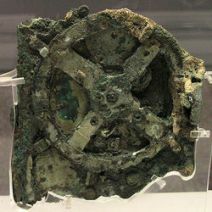 - It is believed that the Antikythera Mechanism included different colored balls to represent the celestial features. For example, a gold ball would have represented the sun. A bright red ball would have represented Mars. This theory was presented by Alexander Jones, who is a historian in New York’s Institute that specializes in studying the Ancient World. - It is theorized that the Antikythera Mechanism was likely used as both a mapping and a navigation device. What is your opinion on the Antikythera Mechanism? Do you believe that it stems from ancient alien technology or that the ancient Greeks created the device for mapping and navigation? Have you observed the pieces of the artifact and the replica at the museum in Athens? Feel free to use our comments section below to share your thoughts on the subject. Below the comments section on this page, you will find a section that allows you to share this content on your favorite social media sites, such as Facebook and Twitter. We would love it if you would share this piece!